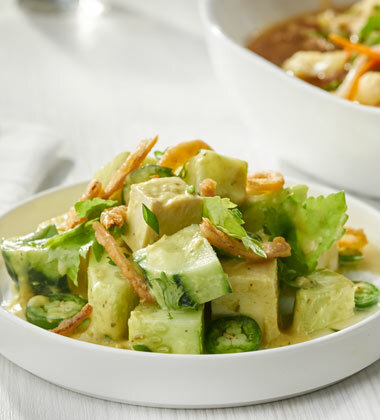 A bold and fresh cucumber salad with tofu and cilantro to give this salad a fresh summer feel. Finished with jalapeño and Campbell's® Reserve Thai Green Curry Sauce. 1 In a medium size mixing bowl add the cucumber, tofu, jalapeño peppers, chives, celery leaves and cilantro. Mix well. 2. Add the Green Curry sauce and fried onions. Mix well. 3. To Serve: Using a 1/2 cup scoop (no. 8), portion serving into bowl. Serve immediately. 1. In a medium size mixing bowl add the cucumber, tofu, jalapeño peppers, chives, celery leaves and cilantro. Mix well. For additional protein, try adding poached or roasted chicken. For optimum flavor, use fried shallots from an Asian market.